I'm helping a mate sort or his 500 or so posters he found in a shed he purchased. He has two copies of this daybill pictured and we are trying to find out if it is a printing mistake, or an actual movie. 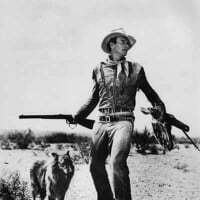 As you can see there is no movie title, just the cowboy. Hope I am in the correct forum. Your image is a stock poster as suggested by Chris. The poster is very late 1960's or 1970's. The western stock poster that preceded this one appears below. 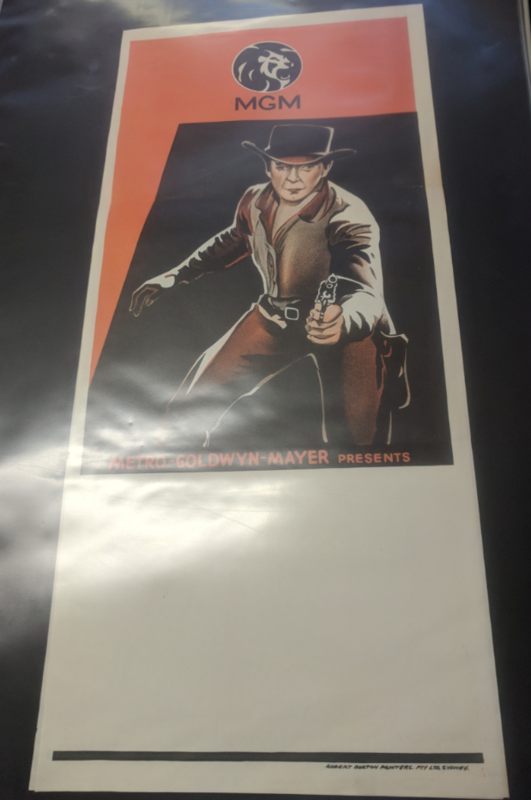 This MGM western stock poster most likely printed between 1965-1967. This ''Stylized Lion'' logo was used throughout the 1970's as well, and a couple of examples follow below. From a British Quad printed for Shaft ( 1971 ). That's Entertainment ( 1974 ) Australian daybill. Thanks for everyone's help, are these rare or valuable? I'm presuming they are fairly common. The dates sound correct as it is from an outback drive-in that was open between the late 50's and closed in 1979 I think. I don't believe the poster is fairly common, but on the other hand they aren't worth much. You can currently purchase a copy in the market place for $ 20.00. It would be great to know some of the titles from the shed find that you believe are the pick of the crop. You are completely correct. I was going on info found on Wikipedia. By simply checking the MGM one-sheets in my own database, I can see that the ''Stylized Lion'' logo was used throughout the 1970s. I need to quit reading Wikipedia as though it is always reliable, and most important of all, I need to never challenge Lawrence! My apologies. The likely printed between 1965-1967 stock western daybill, and a later colour printed version of the same design with the new altered MGM logo appearing on it. Regarding your earlier apology Bruce no problems with me. Wikipedia isn't always the most reliable place to find information, but it can be helpful at times. 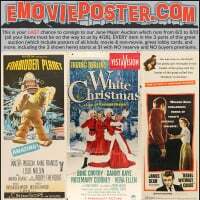 We have sorted through the 500 or so posters and I think most are fairly common but in good condition (my opinion). Some of the 'pick of the crop' are the Batman movie with Adam West, Thunderballs, Get Carter original, several Hammer films, several B grade horrors including the Green Slime, several old Australian films, 2001 one sheet, The Godfather (red)plus heaps of one or two coloured prints of daybills that seem to be hard to fine. Much like the printing on the Jedda daybill I put a comment on about a year ago. Thanks Randolph for your update. With the 2001 one sheet you mentioned, I was wondering if it is a rare original release poster or the late 1970's re-release version? I would love to see any images that you feel inclined to show us from the shed purchase. I will find out for you, I'm back out there next weekend.